Tradition of beer industry in Slovakia takes origin in 19th century, when production of beer primarily appeared in this country. Slovaks love beer, which is confrmed by gradually increasing number of beer producing facilities. Production of beer has signifcant impact on development of Slovak economy, direct foreign investments, creation of new jobs, technology modernization etc. There are also many significant multinational corporations operating in Slovakia such as Heineken International, Topvar, Steiner and others. Signifcant revolution is going on also in the sector of small independent craft breweries in Slovakia. The objective of this paper is to emphasize the importance and impact of beer industry on Slovakian economy and to analyze advantages and disadvantages of the sector in this area. 1.Barat, P. (2001). Sociológia, Slovenská poľnohospodárska univerzita, Nitra, ISBN 80-7137-834-8, (151 pages). 6. Kotler, P. (2000). Marketing podle Kotlera, Management Press, Praha, ISBN 80-247-0016-6, (442 Pages). DUDIĆ, Branislav et al. BEER AND BEER INDUSTRY IN SLOVAKIA. 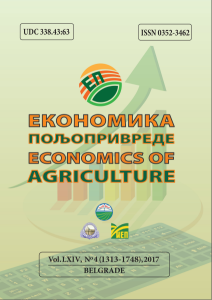 Economics of Agriculture, [S.l. ], v. 65, n. 1, p. 349-354, jan. 2018. ISSN 2334-8453. Available at: <http://ea.bg.ac.rs/index.php/EA/article/view/27>. Date accessed: 19 apr. 2019. doi: https://doi.org/10.5937/ekoPolj1801349D.